Congratulations to Robin Maxwell, author of O, Juliet which debuted today in bookstores in the US! I interviewed Maxwell last week about her books and her writing life last week: Eight Questions for Robin Maxwell. Robin is the author of eight works of historical fiction all of which feature strong heroines in remarkable situations. I first encountered her work when I picked up Signora Da Vinci in a bookstore last fall. Signora Da Vinci is an imagined look at Leonardo da Vinci's life through the eyes of his mother. Maxwell fabricates a fantastical life for the mother of the genius -- a woman who we know almost nothing about in actuality. What results is a fun read! 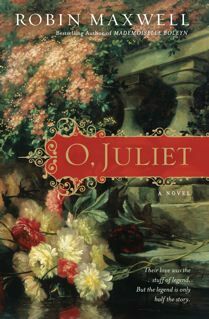 I received an advance copy of O, Juliet which I read over the Christmas holidays. Again, Maxwell has taken on a familiar story -- this time Romeo and Juliet. But she has made it her own. Set in Florence (not "fair Verona"), Juliet and Romeo are not only "star-crossed lovers" but they are also poetry fans, obsessed with Dante. She presents a full, tantalizing take on a familiar story in clear prose. Poetry fanatics beware: Maxwell's Romeo and Juliet write their own poetry, too, which is stylistically anachronistic. But that's the beauty of historical fiction: the voices of another era can speak in today's cadence and be relevant to another generation. Both O, Juliet and Signora Da Vinci, as well as all of Robin Maxwell's books, are available in The Gypsy's Store. A small portion of your purchase price helps to keep this blog going.